How to watch American Horror Story: Cult (2017) on Netflix Denmark! Yes, American Horror Story: Cult is now available on Danish Netflix. It arrived for online streaming on August 13, 2018. We'll keep checking Netflix Denmark for American Horror Story: Cult, and this page will be updated with any changes. Season 1 of American Horror Story has 12 episodes. Because different Netflix countries have different availability for episodes, you'll need to check the episode listing below to see which are available in Denmark. Serial killer enthusiasts reenact the brutal murders of two nursing students. Ben goes back to Boston to fix a mistake involving an old flame. Vivien learns about her house's first resident: a crazed surgeon named Dr. Montgomery. Meanwhile, Ben confronts Moira about his suspicous coffee. While on a date with Violet, Tate is harassed by a group of bloody teens. Meanwhile, Ben and Vivien are haunted by one of the house's newest guests. Tate tells Violet that she can tell ghosts to leave her alone, and she takes solace in this. Meanwhile, Vivien learns she is pregnant. The man in the rubber suit is revealed, and Vivien has a violent situation arise with Ben. One of history's most famous murder victims, Elizabeth Short, pays the house a visit. Constance discovers more about Tate. Ben finds out that Violet hasn't been in school for weeks. 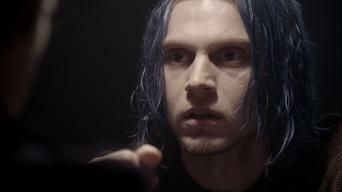 He also finds out who Tate really is. Constance schemes to raise Tate's baby as her own. Ben contemplates suicide. Season 2 of American Horror Story has 13 episodes. Because different Netflix countries have different availability for episodes, you'll need to check the episode listing below to see which are available in Denmark. 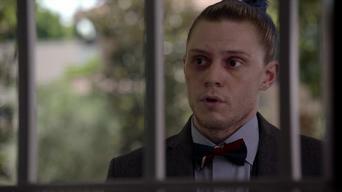 Welcome to Briarcliff Manor, a notorious insane asylum that is home to a deranged serial killer known as Bloody Face. A group of patients attempt to escape from Briarcliff during a violent storm. Sister Jude digs up dirt on Arden. Later, Kit makes a surprising confession and Bloody Face is unmasked. The Monsignor takes on an unlikely convert. Lana secures a new piece of evidence that can exonerate Kit. Dr. Arden witnesses a miraculous return. Grace brings Kit devastating news about the aliens' experiments on Alma. Dr. Thredson gets an unexpected visitor. The Monsignor tries to silence Jude. Season 3 of American Horror Story has 13 episodes. Because different Netflix countries have different availability for episodes, you'll need to check the episode listing below to see which are available in Denmark. When Zoe exhibits a strange and terrible power, her parents ship her to a New Orleans home for those like her: witches descended from Salem. Fiona threatens a long-standing peace when she delves into Mme. LaLaurie's past, and Zoe and Madison resurrect one of the frat boys Madison killed. Madison and Nan enrage the academy's pious new neighbor, Joan. Meanwhile, Fiona learns she has cancer, and Madison develops pyrokinesis. Fiona threatens the fragile peace with Marie Laveau, and the Council of Witchcraft appears to investigate Madison's disappearance. 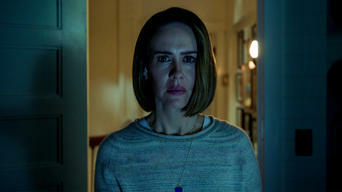 Fiona falls in love with the Axeman, and Marie Laveau offers Queenie a place with the practitioners if she'll deliver Mme. LaLaurie. Cordelia encourages the girls to confront Fiona and force the selection of the next Supreme. Meanwhile, Marie Laveau begins her torment of Delphine. Fiona proposes joining forces with Marie Laveau against witch hunter Hank, and Myrtle finally has her revenge against the Council of Witchcraft. Fiona invites Stevie Nicks to the academy to sway potential Supreme (and Nicks superfan) Misty, and Nan learns the truth about Luke's death. Fiona and Marie Laveau face off against the witch hunters of the Corporation, while Madison and Zoe feud over who deserves to be with Kyle. Cordelia regains her precognitive abilities and sees doom for the coven. 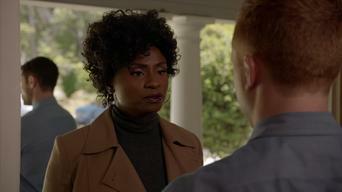 Meanwhile, Queenie confronts Marie Laveau, with diabolical consequences. Season 4 of American Horror Story has 13 episodes. Because different Netflix countries have different availability for episodes, you'll need to check the episode listing below to see which are available in Denmark. With a killer on the loose, police impose a curfew on Jupiter. Elsa hires strongman Dell to handle security, unaware of his dark past with Ethel. To Elsa's annoyance, the freaks refuse to perform on Halloween, fearing a visit from freak ghost Edward Mordrake. Ethel receives some shattering news. Mordrake hunts for a freak soul to add to his ghost troupe, prompting Elsa to reveal her past. Jimmy and Maggie have a violent run-in with Twisty. 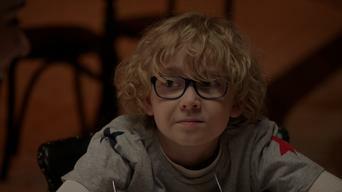 Stanley unleashes his plan to murder the freaks, while Gloria hides evidence of Dandy's gory crimes and Desiree learns she is not what she seems. To prepare for her upcoming TV show, Elsa practices her dicey new knife-throwing act. At Mott Manor, Dandy declares his love for Bette and Dot. 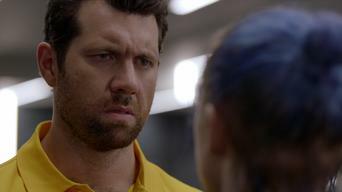 After retrieving the twins, Jimmy wonders about Dandy's connection to the clown murders, while the freak show women confront the murderous Dell. Ma Petite's murder leads to a clash between Ethel and Elsa. Gloria desperately tries to save Dandy, while Jimmy connects with the show's new freak. After a positive reading from Maggie, Dandy resumes his killing ways, while a sad, drunken Jimmy struggles to perform at a doomed Tupperware Party. 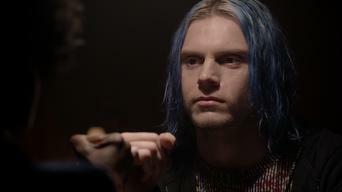 Salty's death sparks trouble in Pepper and prompts Elsa to reveal the freak show's history. The twins try to help Jimmy after his arrest for murder. As Elsa readies to move, the twins are seduced by an aspiring magician with a creepy past. To get out of jail, Jimmy makes a risky deal with Stanley. 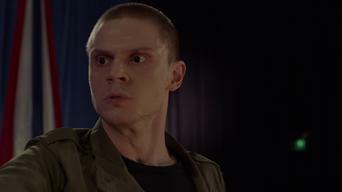 After Maggie outs Stanley as a homicidal conman, the freaks plot their grisly revenge. With Elsa's help, Jimmy comes to terms with his new deformity. With Elsa gone, Dandy takes over the show and disaster soon follows. After a discouraging start in Hollywood, Elsa's fortunes take an unexpected turn. Season 5 of American Horror Story has 12 episodes. Because different Netflix countries have different availability for episodes, you'll need to check the episode listing below to see which are available in Denmark. On the trail of a serial killer who murders couples in gruesome fashion, detective John Lowe follows an anonymous tip to the Hotel Cortez. Iris tells John the story of the Hotel Cortez and its twisted original owner, James Patrick March. Will presides over a fashion show in the lobby. An ex-lover seeks revenge on the Countess. Memories of Holden haunt Alex. Tristan tries to stop Will from revamping the Cortez. On Devil's Night, serial killers flock to the Cortez for a celebratory dinner. Alex takes Holden home, hoping to figure out what's wrong with him. Alex takes extraordinary measures to help Max. Iris bonds with Liz Taylor when demanding guests test her patience on Halloween. Ramona and Donovan return to the Cortez to exact vengeance. John is plagued by disturbing visions. Liz Taylor falls in love. As renovations continue at the Cortez, a secret from the hotel's past comes to light. John checks himself into a psychiatric hospital. John discovers the identity of the Ten Commandments Killer, and Sally's arrangement with March comes to light. As the Countess's wedding approaches, she schemes to reunite with a long-lost love. Alex tries to bring the children back to the Cortez. Liz Taylor and Iris make a fateful decision. 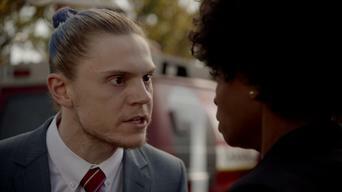 Donovan confronts Rudy. Alex enlists John in her quest to help the children. Iris and Liz Taylor enlist Ramona in their efforts. Sally reminisces about her past, and John bags another trophy. Iris and Liz Taylor usher in a new era at the Cortez, which may be declared a historical landmark ... if the guests can behave themselves. Season 6 of American Horror Story has 10 episodes. Because different Netflix countries have different availability for episodes, you'll need to check the episode listing below to see which are available in Denmark. After a violent attack, Matt and Shelby Miller relocate to rural North Carolina, where a series of bizarre and disturbing events begins to unfold. Matt and Shelby learn more about the house's history and ask the local police for assistance. Lee and Flora run into different types of trouble. While searching for Flora, the Millers make a disturbing discovery. Later, Lee pays a psychic to help locate her daughter. Cricket faces down a damning truth. Shelby's paranoia continues to grow. The Millers receive a troubling history lesson. The Roanoke House's dark origin is uncovered. Shelby and Matt face an unwinnable battle. Lee's criminal case takes a turn. Spurred by the immense success of "My Roanoke Nightmare," the producer arranges a follow-up featuring Matt, Shelby, Lee and the original cast. An obsessed Agnes gets into character, Shelby learns of Matt's reasons for returning to the house, and the Polks prepare something special. Shelby and Dominic hatch a desperate plan to escape the house. Lee, Monet and Audrey find their situation growing worse by the minute. Three "My Roanoke Nightmare" fans go in search of the infamous house. Audrey, Lee and Dylan make a return trip to the Polk compound. Lee agrees to sit down with famed journalist Lana Winters, but the live television interview doesn't go according to plan. Season 7 of American Horror Story has 11 episodes. Because different Netflix countries have different availability for episodes, you'll need to check the episode listing below to see which are available in Denmark. Following the 2016 presidential election, a distressed woman's phobias intensify and a troubled young man becomes politically inspired. As disturbing visions plague Ally, she and Ivy get new neighbors. Meanwhile, Kai campaigns for city council, and violence shakes the restaurant. Following a tragedy at home, Ally finds her community turning hostile. The Wiltons give Oz a gift. A mysterious truck cruises the neighborhood. Kai demonstrates his powers of persuasion on Harrison. Beverly finds an unusual solution to her problems. Following a confrontation, Ivy fights back. Beverly's boss begins to doubt some of her stories, Ivy takes a big step, and Meadow shares a shocking secret with Ally. A new candidate challenges Kai for the city council seat. Ally stages a daring rescue. A political rally turns violent. Kai's growing fame brings with it a new breed of believer. A mysterious stranger issues a warning to Ivy, Beverly and Winter. As resentment grows within the movement, Winter shares a harrowing story. Meanwhile, Vincent opens up about his family history. Kai announces his long-term plans and asks his followers to prove their loyalty. Ally and Ivy have a heart-to-heart. 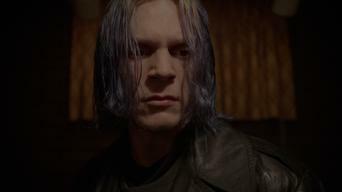 With his paranoia rising, Kai begins to suspect his movement has been infiltrated. Beverly receives help from an unexpected source. Kai adjusts to his new circumstances. Meanwhile, Ally strives to put the past behind her -- but old enemies die hard.